FROM Mike Fahey at Kotaku -- full post/article HERE. The diabolical gamer-targetingMountain Dew Game Fuel returns this year, dropping Halo 3 in favor of the massively multiplayer online sensationWorld of Warcraft. 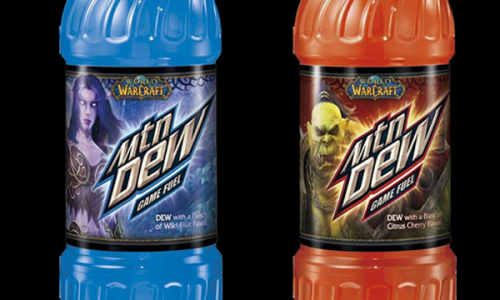 Not only is Mountain Dew switching genres and publishers, they're also switching up their strategy for theWorld of Warcraft Game Fuel releases, introducing much-needed player-versus-player combat to the sugary soft drink market. Do you choose the cherry-citrus tang of Horde Red, or the smooth wild fruit taste of Alliance Blue? Does in-game allegiance carry over to the soft drink aisle, or can a player rocking a Gnome Warrior online partake of a drink with an Orc Shaman plastered across the label? The answers to these questions and more come this summer, when the unholy alliance between Mountain Dew and Blizzard hits store shelves.